Afonwen Laundry are one of very few suppliers that constantly collects, re-washes and returns the same product time and time again. We've been recycling linen since 1935, long before it was even fashionable to go green. We are committed to improving and reducing our impact upon the environment. Introduced a number of Heat Recovery initiatives, including recovering excess flash steam from our boilers, installing water heat recovery systems and reduced overall energy consumption. Operate a water recycling plant using Reverse Osmosis technology. We recycle up to 60% of the mains water we use in our Cardiff production facility. Installed the most energy efficient gas dryers to reduce our gas consumption, especially when drying towels. Operate a full chemical and biological water treatment plant in North Wales to treat our own effluent. Monitor and control our usage of chemicals with monthly independent auditing. Use modern, environmentally friendly, washing machines. 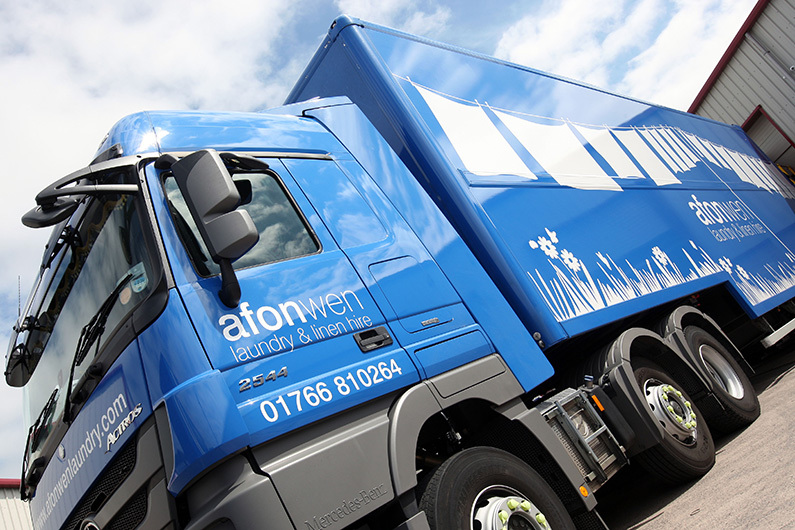 Monitor weekly our energy consumption including gas, electricity and fuel for our distribution fleet. Installed tracker systems on all our HGV lorries to monitor route utilisation and are adopting 'teardrop' boxes to improve fuel efficiency. All lorries have tracker systems to ensure we can advise accurately on delivery times. Continuously review ways of reducing our impact, cutting costs and doing our bit to keep the planet in good shape for future generations to come.